Sergio Almagro ('Lucky') and Pedro Martínez ('Luke'), from Murcia in Spain, form the bluegrass duo Lucky & Luke (also on Facebook here) and belong to the Spanish Association of Bluegrass. Thanks to Sergio for the news that the group is available for festival bookings in Europe. The deadline is past for applying to play at this year's European World of Bluegrass Festival (9-11 May 2013) in the Netherlands, but applications for the La Roche Bluegrass Festival (31 July-4 Aug. 2013) in France are open till 10 February - see above. 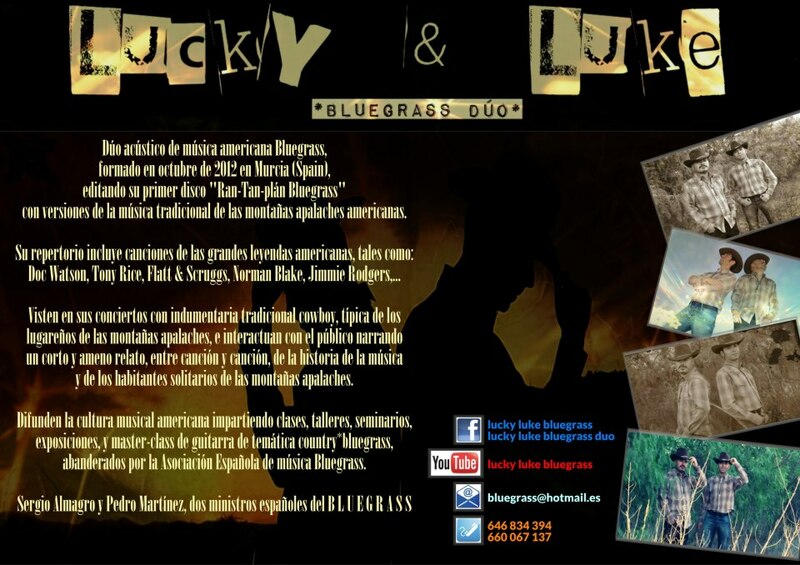 A playlist of their music can be heard on the GoEar website, and an eight-minute dramatic video, 'El Sheriff', with Lucky & Luke playing 'Guitar polka' and 'East Tennessee blues' as background to the action, can be seen on YouTube. Their e-mail contact address is here. Update: Thanks again to Sergio for a copy (shown below) of the Lucky & Luke card dossier with text in English instead of (as shown above) in Spanish.